Formerly known as Hyatt Gold Passport, World of Hyatt unlocks rewards at hundreds of hotels for program members. Featuring four different tiers of membership and redeemable points at hotels on six continents, with this program, there’s little limit to where travelers can go with their loyalty points. Based on our most recent analysis of hotel loyalty programs, World of Hyatt points hold the most value among hotel rewards programs and the most value for luxury travelers. When using points for free hotel nights, each World of Hyatt point is worth 1.7 cents each. The program also allows members to earn additional free nights by earning status, or by holding The World Of Hyatt Credit Card. On the downside, although it has over 700 properties in its portfolio, that makes Hyatt one of the smaller hotel programs in the world. Finding a Hyatt hotel at your destination may be slightly more difficult than with other brands. Is World of Hyatt the right loyalty program for you? Are some World of Hyatt redemptions better than others? We went through it with a fine-toothed comb to find the best and worst redemption options of this hotel loyalty program. Hyatt Place: An upscale hotel positioned as the entry-level experience, Hyatt Place offers the traditional amenities, like workout facilities and cocktail bars. World of Hyatt members who book through the Hyatt website can also get free breakfast during their stay. Hyatt House: The upscale extended-stay brand of Hyatt features apartment-style suites with amenities like cooking areas and full-size refrigerators. Hyatt House locations are most commonly found in urban areas, around college campuses, or near airports. Hyatt Centric: Hyatt Centric hotels are comparable to boutique, upper-upscale hotels marketed as delivering a lifestyle experience that allows guests to live like a local. Hyatt Regency: This upper-upscale brand of Hyatt focuses on the needs of the business traveler. Guests can expect fully stocked business centers, an on-site restaurant, to-go markets and meeting spaces. Grand Hyatt: A step beyond boutique hotels, Grand Hyatt luxury hotels are found only at select destinations. Combining eye-catching architecture and design with full-service amenities, Grand Hyatt is one of the group’s two luxury brands. Park Hyatt: The highest luxury brand in the Hyatt portfolio, Park Hyatt hotels offer smaller properties focused on residential-style accommodations with premium amenities, from on-site spa services to upscale dining and fitness centers. Other brands in the Hyatt portfolio include: Andaz, Hyatt Zilara, Hyatt Ziva, Miraval Resorts and The Unbound Collection by Hyatt. When Hyatt Gold Passport became World of Hyatt, the first noticeable change was the elimination of the traditional loyalty tiers: silver, gold and platinum. Instead, members qualify for one of four levels based on how many nights, base points, or qualifying meetings or events they book every year: member, Discoverist, Explorist and Globalist. World of Hyatt member. All members start as World of Hyatt members. Upon signing up for the program, members can earn 5 base points for every $1 spent on qualifying stays, dining and spa experiences charged at the hotel and 10 points for every $1 spent on FIND experiences. Standard internet access is free at participating hotels, and those who book their Hyatt Place stay through Hyatt.com may also qualify for free breakfast during their stay. Members also qualify for Member Rate discounts at participating hotels and resorts when they make reservations either online or through the dedicated reservations telephone number. When members use points for an award night, resort fees are waived. World of Hyatt Discoverist. After staying 10 qualifying nights, earning 25,000 base points, hosting three qualifying meetings or events, or opening The World Of Hyatt Credit Card, members qualify for the World of Hyatt “silver” status, Discoverist. Members still earn 5 points for every $1 spent on qualifying stays, dining and spa experiences, as well as 10 points for every $1 spent on FIND experiences. But members at this level earn 10% bonus points when they choose points as their rewards. In addition to faster complimentary internet and waived resort fees on award nights, Discoverist members receive a complimentary bottle of water every day of their stay, have a dedicated check-in line and can request a late checkout of 2 p.m. at participating locations. Although they won’t get upgrades, they will receive the preferred room within their type booked upon arrival. Finally, World of Hyatt Discoverist members can match their status to Pearl level in MGM Resorts’ M life loyalty program. World of Hyatt Explorist. Members reach the Explorist “gold” status of World of Hyatt by staying 30 qualifying nights, earning 50,000 base points, or hosting 10 qualifying meetings or events. Although Explorist members earn the same amount of base points as lower tiers, they can earn 20% bonus points on their earned base points. In addition to previous tier benefits, Explorist members receive an upgrade to the best room available at check-in (excluding suites) and four Club lounge passes on eligible rates or when redeeming points for free night awards. Explorist members can match their status to Gold status in the M Life program, and can also request room reservations as soon as 72 hours ahead of their planned stay, although blackout dates apply. World of Hyatt Globalist. At the top of the World of Hyatt loyalty program is Globalist status, equivalent to “platinum” in other programs. Globalist is earned after staying 60 qualifying nights, earning 100,000 base points, or hosting 20 qualifying meetings or events. While they earn the same amount of base points as other members, Globalist members earn 30% bonus points when staying at hotels. In addition to the benefits of lower tiers, Globalist members get upgrades to the best available room at check-in, including standard suites, and can request a late checkout of 4 p.m. at participating locations. Globalists can also access the hotel club lounge with every stay, receive complimentary parking at participating hotels and resorts and priority access to available rooms when checking in early. Upon qualifying for Globalist status each calendar year, members get four suite upgrade awards for use on qualifying stays. And when booking an eligible award for someone else, those guests will receive some elite benefits through the hotel’s Guest of Honor program. The most loyal guests can earn lifetime Globalist status in World of Hyatt. After earning 1 million base World of Hyatt points over the course of their membership, travelers receive their lifetime status. This designation grants all the benefits of Globalist every year, including one free night award up to Category 7, and four suite upgrade awards every March. In order to qualify for lifetime status, all points must be earned in the same account. Only base points earned from eligible room rates, eligible incidental charges and eligible non-stay charges count toward lifetime status. Points earned from elite status bonuses, points earned from a Hyatt-branded credit card, or points transferred from other programs don’t count. And if a member’s account is canceled for any reason (including inactivity), any forfeited lifetime points can’t be applied to another account. Compared with other hotel programs, World of Hyatt seems to be designed with additional focus on luxury and business travelers. As a result, earning World of Hyatt rewards comes to life through combining earning opportunities across hotels, partner programs and The World Of Hyatt Credit Card. No matter what loyalty tier you belong to, all World of Hyatt members earn the same number of points for their stay: 5 base points for every eligible $1 spent on qualifying stays, dining and spa experiences. However, elite members of this program earn bonus points on top of their base points. The bonus is based on your status: Discoverists receive 10% bonus points, Explorists receive 20% bonus points and Globalists receive 30% bonus points. World of Hyatt members: 500 base points. Discoverist elite: 500 base points and 50 bonus points. Explorist elite: 500 base points and 100 bonus points. Globalist elite: 500 base points and 150 bonus points. While base points count toward elite and lifetime status, bonus points do not. In the example above, a Globalist member would earn 500 points toward elite and lifetime status, but the extra 150 bonus points apply only toward future awards. In addition to the traditional way of earning points through hotel stays, World of Hyatt members can also earn elite-qualifying points by booking FIND experiences direct from the World of Hyatt website. FIND is a collection of experiences offered through luxury partner IfOnly that are not necessarily available at the hotel or through an online travel agency. Las Vegas: A private feeding and yoga session with baby goats at Goat Yoga. New York: A private bonsai class with artist Julian Velasco. Chicago: An Amalfi pasta making class and dinner experience with chef Aram Reed. Boston: Group rowing outing in Boston Harbor. Miami: Melt and pour soap-making and natural beauty workshop. While these experiences are an easy way to earn World of Hyatt points quickly, they can be pricey. While some cost less than $100 per person, events like joining a quarterback camp with a former Super Bowl champion in San Francisco or having best-selling author Edward Vilga critique your work in New York can cost upwards of $500. To book an event, every World of Hyatt member must create a separate account on the FIND website. Each experience will earn 10 base World of Hyatt points per eligible $1 spent, which apply toward elite and lifetime stays. But the rewards apply only to World of Hyatt points, and will not earn points in partner programs, airline programs, M life rewards, or any other substitute in lieu of points. Hyatt has only one credit card that earns points toward future rewards: The World Of Hyatt Credit Card. While the card comes with a $95 annual fee, cardholders can receive one free night at any Category 1-4 Hyatt hotel or resort every year after their card member anniversary. When using the card, cardholders earn 9 points total per $1 spent at Hyatt hotels: 4 bonus points per $1 spent at Hyatt hotels and 5 base points per $1 spent as a World of Hyatt member. Card members also earn 2 points per $1 spent at restaurants, on airline tickets purchased directly from the airline, on local transit or commuting and fitness club or gym memberships. Everywhere else, the card earns 1 point per $1 spent. As long as you have the card open, you will have World of Hyatt Elite status, and will receive 5 qualifying night credits toward your next tier status every year. Additionally, you can also earn two more qualifying night credits every time you spend $5,000 on your card in a calendar year, along with an extra free night at any Category 1-4 hotel or resort if you spend $15,000 during your anniversary year. You can also transfer Chase Ultimate Rewards® points earned from the Chase Sapphire Preferred® Card or Chase Sapphire Reserve® cards. Points transfer at a 1-to-1 ratio and must be transferred in increments of 1,000 points. In addition to the FIND experiences and The World Of Hyatt Credit Card, there are plenty of different ways World of Hyatt members can earn points toward rewards. The methods range from renting cars with a partner, to staying at select Las Vegas resorts. Earn 500 bonus points for Avis car rentals: World of Hyatt members not only get up to 25% off base rates for each qualifying car rental through participating Avis locations, but they can also earn 500 World of Hyatt points per rental. To receive the points for every car rental, book your Avis reservation with Avis Worldwide Discount number K817700 on Avis.com. Be sure to provide your World of Hyatt number during your reservation and at the time of rental — otherwise, you may not earn the points. Earn base points at participating M life Rewards destinations: Fans of Las Vegas can also earn base World of Hyatt points with select stays, even if they aren’t at Hyatt hotels. Members can earn 5 base points for every eligible $1 spent at participating M life Rewards destinations, as well as qualifying night and base point credit toward World of Hyatt elite status. Qualifying nights are defined as any night where payment is made directly to an M life Rewards destination, M life Rewards destinations booked through Hyatt.com, or bookings made through the Hyatt Global Contact Center. To earn base points and qualifying nights, members must join both World of Hyatt and M life Rewards and provide both numbers at check-in. Purchase World of Hyatt bonus points: If you’re short on World of Hyatt points, it’s possible to purchase bonus points to get you closer to your next award or keep your account alive. You can purchase bonus points in 1,000-point increments for $24 each, up to 55,000 per transaction. While purchased bonus points don’t count toward status, they are a qualifying activity that will keep a dormant account alive. 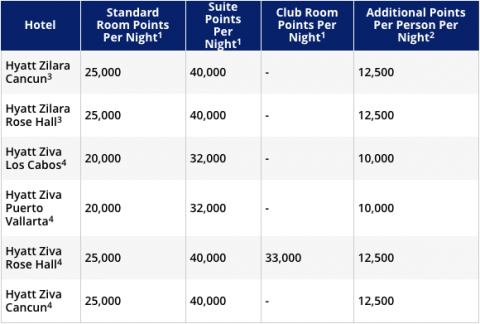 While we generally don’t recommend purchasing points as a habit, buying points at 2.4 cents each is just over our estimated average value per point when using them for free hotels. Although most people associate World of Hyatt points with hotels, there are many different ways to use them. From free resort nights to airline partner transfers, it seems there are very few limits to redeeming points. Perhaps the best use of World of Hyatt points is at the over 700 properties around the world. 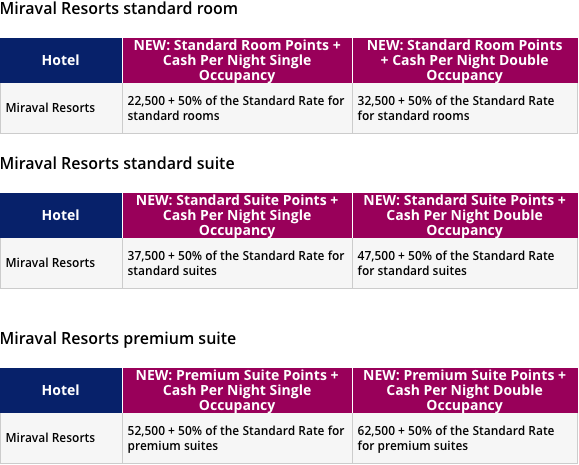 Award categories range from Category 1 to Category 7, with prices for a standard room award ranging from 5,000 points per night to 30,000 points per night. When using your points for hotel night awards, we estimate your points are worth 1.7 cents each, which is the highest overall return for any rewards program we surveyed. Using your points for hotel awards is one of the best returns you can get anywhere in the industry. In practice: If you are staying at a Category 4 hotel on a Points + Cash award and the standard rate for the room is $150, you would pay 7,500 World of Hyatt points and $75. To determine if a Points + Cash award is a good value for your stay, compare the standard room rate with the value of the points you would use. If your points and cash equivalent is less than the cost of the standard rate, then it is a good deal. 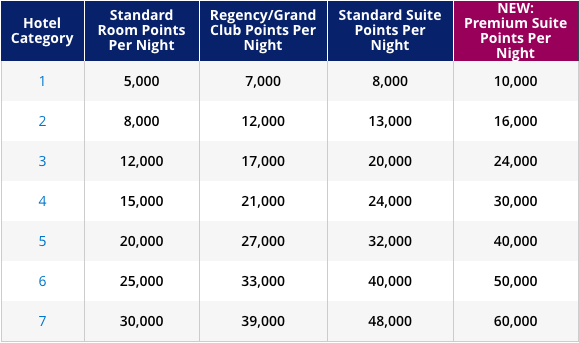 While upgrades to the Regency Club/Grand Club level cost 3,000 points per night, upgrades to suites can cost between 6,000 and 9,000 points per night. If you have a long stay ahead of you, upgrading with points can cost the same as a standard room award. Unless it’s a special occasion, or you have no other use of your points, this might not be the best use of points. However, this is not an optimal use of your points. Because points exchange at a rate of 0.5 cent per point, you would lose significant value by using points at the hotel for a spa treatment, in-room movie or meal. Although they may be expensive, all-inclusive resort stays come with all the amenities one can imagine. Before walking away from these high points prices, consider how much it would cost to go on vacation to one of these resorts. If the points price is better than paying in points at a value of 1.7 cents per point, then it’s probably a good deal. Excalibur: 12,000 points per night. New York-New York: 15,000 points per night. Park MGM Las Vegas: 15,000 points per night. MGM Grand: 15,000 points per night. The Mirage: 20,000 points per night. Mandalay Bay: 20,000 points per night. The Signature at MGM Grand: 20,000 points per night. Vdara: 20,000 points per night. Delano Las Vegas: 25,000 points per night. Bellagio: 25,000 points per night. New York-New York, Park MGM Las Vegas or MGM Grand: $255 per night. The Mirage, Mandalay Bay, The Signature at MGM Grand or Vdara: $340 per night. Delano Las Vegas or Bellagio: $425 per night. While hotel rooms are the primary way World of Hyatt members use their points, there are still other ways members can use excess points. The three additional ways members can exchange their well-earned points are toward FIND experiences, exchanging them for airline miles with participating airlines, or exchanging points for Avis car rental certificates. FIND experiences: If you have a once-in-a-lifetime experience lined up but don’t want to pay cash for it, FIND experiences can be paid for with World of Hyatt points. The number of points you will need for an experience directly correlates with the price of the experience. Exchanging for airline miles: World of Hyatt points can be transferred to 30 airline frequent flyer programs, including American AAdvantage, Delta SkyMiles, Southwest Rapid Rewards and United MileagePlus. Points convert at a ratio of 2.5 World of Hyatt points for every one frequent flyer mile, and a minimum of 5,000 points is required for each conversion request. 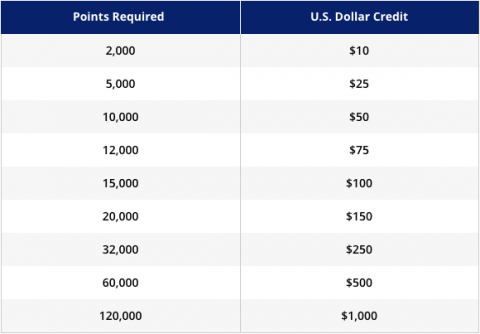 Over 5,000 points, points must be transferred to miles in increments of 1,000 points. Using points for car rentals: You can also exchange World of Hyatt points for Avis car rental certificates, to cut down on car rental fees. For 6,000 points, members can receive a certificate good for one day of an intermediate-size car rental with Avis. With so many options to redeem World of Hyatt points, which make the most sense? Based on our value of World of Hyatt points, here are the best use of points we could find. Hyatt hotels: It should go without saying that the most value for your points comes from redeeming them at hotels. When using your points at hotels around the world, we estimate your points are worth 1.7 cents each. At Category 5-7 hotels, your value can range from around one cent each, to over three cents each. If you enjoy staying at upscale and luxury hotels, your best use of World of Hyatt points is toward free room nights. 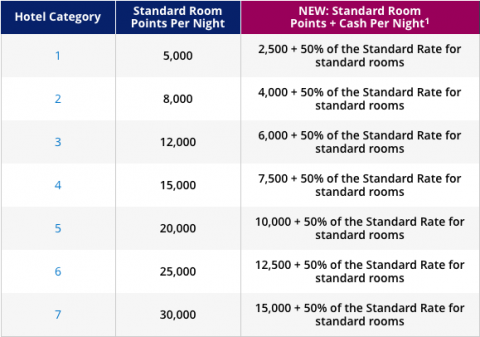 Points + Cash awards: When Hyatt changed its Points + Cash awards from a flat fee and points to 50% of the required points and 50% of the standard room rate, many people called it a devaluation of points. However, in some situations, 50% of the standard room rate is less than the flat fee. Points + Cash options remain a good deal, especially if it can get you a discount on a great place to stay. MGM Resorts: Considering how easy it is to get a discounted rate on a resort room in Las Vegas, redeeming World of Hyatt points for rewards is a losing bet. At our estimated value of 1.7 cents per point, some hotels would have to be going for over $200 per night for points to be a better deal. While that could be the case at Bellagio or Vdara, that probably won’t be your price for a stay at Excalibur or New York-New York. If we were you, we would pass on these deals. Transfer to airline partners: When forced to exchange 5,000 points for 2,000 frequent flyer miles, you are leaving a little bit of value on the table. We value 5,000 World of Hyatt points at around $83 of value toward hotels, which you may not be able to recover when using them to book an airline award. While this can be useful in an emergency to get the final miles needed for a flight, this isn’t the best way to use your World of Hyatt points. Hyatt hotel credits: No matter how you use your World of Hyatt points, using them for hotel credits is a very bad idea. When exchanging points for credit toward spa treatments, in-room movies and meals, your points exchange at 0.5 cent each — a significant devaluation from the average value of 1.7 cents per point. You’re better off charging your splurges to your hotel room and earning 5 base World of Hyatt points for each qualifying $1 to get a little closer to a free night or elite status. To determine the value of World of Hyatt points, we analyzed prices in U.S. dollars and World of Hyatt points at Hyatt-affiliated hotels from November 2018 to April 2019 in the 10 largest U.S. media markets as defined by ratings and data company Nielsen, along with five randomly selected media markets. We collected the average prices in cash and points to find the average value of points in cents. The markets are New York; Los Angeles; Chicago; Philadelphia; Dallas/Fort Worth; Washington, D.C.; Houston; San Francisco; Boston; Atlanta; Tulsa, Oklahoma; Kansas City, Missouri; Madison, Wisconsin; Roanoke, Virginia; and Austin, Texas. In addition, 12 of the world’s busiest cities for tourism as defined by the 2017 Mastercard Destination City Index were also analyzed from November 2018 to April 2019 to determine the average price in cash, points and an average value of points in cents. The cities are Bangkok; Hong Kong; Seoul; London; Paris; Istanbul; Mexico City; Lima, Peru; Buenos Aires, Argentina; Dubai, United Arab Emirates; Riyadh, Saudi Arabia; and Abu Dhabi, United Arab Emirates. The average value of 1.7 cents per point was determined from the mean value of all rewards across all surveyed cities. Individual city average values range from 1.2 cents to 2.3 cents per point.